Total health spending per capita, in US dollars adjusted for purchasing power parity of Japan compared to other first world nations. In 2008, Japan spent about 8.5% of the nation's gross domestic product (GDP), or US$2,873 per capita, on health, ranking 20th among Organisation for Economic Co-operation and Development (OECD) countries. That amount was less than the average of 9.6% across OECD countries in 2009, and about half as much as that in the United States. In 2013 expenditure was $479 billion, 10.3% of GDP - about the midpoint of OECD countries. The government has well controlled cost over decades by using the nationally uniform fee schedule for reimbursement. The government is also able to reduce fees when the economy stagnates. In the 1980s, health care spending was rapidly increasing as was the case with many industrialized nations. While some countries like the U.S. allowed costs to rise, Japan tightly regulated the health industry to rein in costs. Fees for all health care services are set every two years by negotiations between the health ministry and physicians. The negotiations determine the fee for every medical procedure and medication, and fees are identical across the country. If physicians attempt to game the system by ordering more procedures to generate income, the government may lower the fees for those procedures at the next round of fee setting. This was the case when the fee for an MRI was lowered by 35% in 2002 by the government. Thus, as of 2009, in the U.S. an MRI of the neck region could cost $1,500, but in Japan it cost US$98. Japan has had "catastrophic coverage" since 1973. Once a patient's monthly copayment reaches a cap, no further copayment is required. The threshold for the monthly copayment amount is tiered into three levels according to income and age. In order to cut costs, Japan does use generic drugs. As of 2010, Japan had a goal of adding more drugs to the nations National Health Insurance listing. Age related conditions remain one of the biggest concerns. Pharmaceutical companies do focus on marketing and research toward that part of the population. People in Japan have the longest life expectancy at birth of those in any country in the world. Life expectancy at birth was 83 years in 2009 (male 79.6 years, female 86.4 years). This was achieved in a fairly short time through a rapid reduction in mortality rates secondary to communicable diseases from the 1950s to the early 1960s, followed by a large reduction in stroke mortality rates after the mid-60s. In 2008 the number of acute care beds per 1000 total population was 8.1, which was higher than in other OECD countries such as the U.S. (2.7). Comparisons based on this number may be difficult to make, however, since 34% of patients were admitted to hospitals for longer than 30 days even in beds that were classified as acute care. Staffing per bed is very low. There are four times more MRI scanners per head, and six times the number of CT scanners, compared with the average European provision. The average patient visits a doctor 13 times a year - more than double the average for OECD countries. In 2008 per 1000 population, the number of practicing physicians was 2.2, which was almost the same as that in U.S. (2.4), and the number of practicing nurses was 9.5, which was a little lower than that in U.S. (10.8), and almost the same as that in UK (9.5) or in Canada (9.2). Physicians and nurses are licensed for life with no requirement for license renewal, continuing medical or nursing education, and no peer or utilization review. OECD data lists specialists and generalists together for Japan because these two are not officially differentiated. Traditionally, physicians have been trained to become subspecialists, but once they have completed their training, only a few have continued to practice as subspecialists. The rest have left the large hospitals to practice in small community hospitals or open their own clinics without any formal retraining as general practitioners. Unlike many countries, there is no system of general practitioners in Japan, instead patients go straight to specialists, often working in clinics. The first general practitioner course was established in Saga Medical University in 1978. In an article titled "Does Japanese Coronary Artery Bypass Grafting Qualify as a Global Leader?" Masami Ochi of Nippon Medical School points out that Japanese coronary bypass surgeries surpass those of other countries in multiple criteria. According to the International Association of Heart and Lung Transplantation, the five-year survival of heart transplant recipients around the world who had their heart transplants between 1992 and 2009 was 71.9% (ISHLT 2011.6) while the five-year survival of Japanese heart transplant recipients is 96.2% according to a report by Osaka University. However, only 120 heart transplants have been performed domestically by 2011 due to a lack of donors. In contrast to physical health care, the quality of mental health care in Japan is relatively low compared to most other developed countries. Despite reforms, Japan's psychiatric hospitals continue to largely rely on outdated methods of patient control, with their rates of compulsory medication, isolation (solitary confinement) and physical restraints (tying patients to beds) much higher than in other countries. High levels of deep vein thrombosis have been found in restrained patients in Japan, which can lead to disability and death. Rather than decreasing the use of restraints as has been done in many other countries, the incidence of use of medical restraints in Japanese hospitals doubled in the nearly ten years from 2003 (5,109 restrained patients) through 2014 (10,682). The 47 local government prefectures have some responsibility for overseeing the quality of health care, but there is no systematic collection of treatment or outcome data. They oversee annual hospital inspections. The Japan Council for Quality Health Care accredits about 25% of hospitals. One problem with the quality of Japanese medical care is the lack of transparency when medical errors occur. In 2015 Japan introduced a law to require hospitals to conduct reviews of patient care for any unexpected deaths, and to provide the reports to the next of kin and a third party organization. However, it is up to the hospital to decide whether the death was unexpected. Neither patients nor the patients' families are allowed to request reviews, which makes the system ineffective. It is important to have efficiency in sending patients to the correct medical location because there is an under-staffing problem. Around 92% of hospitals in Japan have an insufficient number of doctors while having sufficient nurses. While only 10% of hospitals have a sufficient number of doctors and an insufficient number of nurses. Access to medical facilities is sometimes abused. Some patients with mild illnesses tend to go straight to hospital emergency departments rather than accessing more appropriate primary care services. This causes a delay in helping people who have more urgent and severe conditions who need to be treated in the hospital environment. There is also a problem with misuse of ambulance services, with many people taking ambulances to hospitals with minor issues not requiring an ambulance. In turn this causes delays for ambulances arriving to serious emergencies. Nearly 50% of the ambulance rides in 2014 were minor conditions where citizens could have taken a taxi instead of an ambulance to get treated. Due to the issue of large numbers of people visiting hospitals for relatively minor problems, shortage of medical resources can be an issue in some regions. The problem has become a wide concern in Japan, particularly in Tokyo. A report has shown that more than 14,000 emergency patients were rejected at least three times by hospitals in Japan before getting treatment. A government survey for 2007, which got a lot of attention when it was released in 2009, cited several such incidents in the Tokyo area, including the case of an elderly man who was turned away by 14 hospitals before dying 90 minutes after being finally admitted, and that of a pregnant woman complaining of a severe headache being refused admission to seven Tokyo hospitals and later dying of an undiagnosed brain hemorrhage after giving birth. The so-called "tarai mawashi" (ambulances being rejected by multiple hospitals before an emergency patient is admitted) has been attributed to several factors such as medical imbursements set so low that hospitals need to maintain very high occupancy rates in order to stay solvent, hospital stays being cheaper for the patient than low cost hotels, the shortage of specialist doctors and low risk patients with minimal need for treatment flooding the system. Public health insurance covers most citizens/residents and the system pays 70% or more of medical and prescription drug costs with the remainder being covered by the patient (upper limits apply). The monthly insurance premium is paid per household and scaled to annual income. Supplementary private health insurance is available only to cover the co-payments or non-covered costs and has a fixed payment per days in hospital or per surgery performed, rather than per actual expenditure. There is a separate system of insurance (Kaigo Hoken) for long term care, run by the municipal governments. People over 40 have contributions of around 2% of their income. Insurance for individuals is paid for by both employees and employers. This ends up accounting for 95% of the coverage for individuals. Patients in Japan must pay 30% of medical costs. If there is a need to pay a much higher costs, they do get reimbursed up to 80-90%. Seniors who are covered by SHSS ( Senior insurance) only pay 10% out of pocket. As of 2016, healthcare providers spend billions on inpatient care and outpatient. 152 billion in spent on inpatient care while 147 billion is spent on outpatient care. As far as long term goes, 41 billion is spent. Today, Japan has the severe problem of paying for rising medical costs, benefits that are not equal from one person to another and even burdens on each of the nations health insurance programs. One of the ways Japan has improved its healthcare more recently is by passing the Industrial Competitiveness Enhancement Action Plan. The goal is to help prevent diseases so people live longer. If preventable diseases are prevented, Japan will not have to spend as much in other costs. The action plan also provides higher quality of medical and health care. National Cancer Center Hospital in the Tsukiji district of Tokyo. The beginning of the Japanese Health care system happened in 1927 when the first Employee Health Insurance plan was created. In 1961, Japan achieved universal health insurance coverage, and almost everyone became insured. However, the copayment rates differed greatly. While those who enrolled in Employees' Health Insurance needed to pay only a nominal amount at the first physician visit, their dependents and those who enrolled in National Health Insurance had to pay 50% of the fee schedule price for all services and medications. From 1961 to 1982, the copayment rate was gradually lowered to 30%. Since 1983, all elderly persons have been covered by government-sponsored insurance. In the late 1980s, government and professional circles were considering changing the system so that primary, secondary, and tertiary levels of care would be clearly distinguished within each geographical region. Further, facilities would be designated by level of care and referrals would be required to obtain more complex care. Policy makers and administrators also recognised the need to unify the various insurance systems and to control costs. By the early 1990s, there were more than 1,000 mental hospitals, 8,700 general hospitals, and 1,000 comprehensive hospitals with a total capacity of 1.5 million beds. Hospitals provided both out-patient and in-patient care. In addition, 79,000 clinics offered primarily out-patient services, and there were 48,000 dental clinics. Most physicians and hospitals sold medication directly to patients, but there were 36,000 pharmacies where patients could purchase synthetic or herbal medication. National health expenditures rose from about 1 trillion yen in 1965 to nearly 20 trillion yen in 1989, or from slightly more than 5% to more than 6% of Japan's national income. One problem has been an uneven distribution of health personnel, with rural areas favored over cities. In the early 1990s, there were nearly 191,400 physicians, 66,800 dentists, and 333,000 nurses, plus more than 200,000 people licensed to practice massage, acupuncture, moxibustion, and other East Asian therapeutic methods. ^ National health expenditures summary (Report). Ministry of Health, Labour, and Welfare. 2010-09-27. ^ a b c d e OECD. 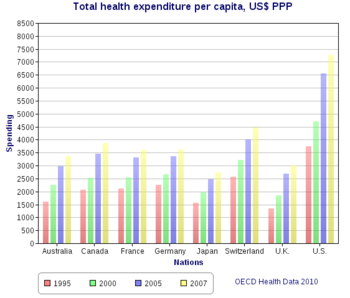 "OECD Health Data". OECD. Retrieved 2 February 2012. ^ a b c Hashimoto, Hideki (24 September 2011). "Cost containment and quality of care in Japan: is there a trade-off?". The Lancet. 378 (9797): 1175. doi:10.1016/S0140-6736(11)60987-2. PMID 21885098. ^ Arnquist, Sarah (August 25, 2009). "Health Care Abroad: Japan". The New York Times. Retrieved January 28, 2010. ^ a b c "Sick around the world". Frontline. April 15, 2008. 17 minutes in. PBS. ^ Reid, T.R. (August 23, 2009). "5 Myths About Health Care Around the World". The Washington Post. Retrieved January 28, 2010. ^ Ito, Masanori (December 2004). "Health insurance systems in Japan: a neurosurgeon's view". Neurologia medico-chirurgica. 44 (12): 624. doi:10.2176/nmc.44.617. PMID 15684593. ^ "Catastrophic coverage". Ministry of Health, Labour and Welfare. Retrieved 3 February 2012. ^ Blecken, David (October 2010). "Healthcare Report: Japan: Hope for Change". Campaign Asia-Pacific: 90–91 – via Ebscohost. ^ Ikeda, Nayu (17 September 2011). "What has made the population of Japan healthy?". The Lancet. 378 (9796): 1094–105. doi:10.1016/S0140-6736(11)61055-6. PMID 21885105. ^ "Patient survey 2008". Ministry of Health, Labour and Welfare. Retrieved 3 February 2012. ^ Britnell, Mark (2015). In Search of the Perfect Health System. London: Palgrave. p. 17. ISBN 978-1-137-49661-4. ^ Hirose, Masahiro (October 2003). "How can we improve the quality of health care in Japan? Learning from JCQHC hospital accreditation". Health Policy. 66 (1): 32. PMID 14499164. ^ Matsumoto, Masatoshi (August 2005). "Factors associated with rural doctors' intention to continue a rural career: a survey of 3072 doctors in Japan". The Australian journal of rural health. 13 (4): 219–220. doi:10.1111/j.1440-1584.2005.00705.x. PMID 16048463. ^ MacDonald (6 September 2001). "Chemoradiotherapy after surgery compared with surgery alone for adenocarcinoma of the stomach or gastroesophageal junction". NEJM. 345: 725–30. doi:10.1056/nejmoa010187. PMID 11547741. ^ Sakuramoto (1 November 2007). "Adjuvant chemotherapy for gastric cancer with S-1, an oral fluoropyrimidine". NEJM. 357: 1810–20. doi:10.1056/nejmoa072252. PMID 17978289. ^ Ochi, Masami (2012). "日本の冠動脈外科は世界標準を超えているか？". 日外会誌 Journal of Japan Surgical Society. 113 (3): 273–277. ^ Steinert, T.; et al. (2010). "Incidence of seclusion and restraint in psychiatric hospitals: A literature review and survey of international trends". Soc Psychiatry Psychiatr Epidemiol. 45 (9): 889–897. ^ Ishida, Takuto; et al. (2014). "Incidence of Deep Vein Thrombosis in Restrained Psychiatric Patients". Psychosomatics. 55: 69–75. ^ Masters, Kim (2017). "Physical Restraint: A Historical Review and Current Practice". Psychiatr Ann. 2017. 47 (1): 52–55. ^ Britnell, Mark (2015). In Search of the Perfect Health System. London: Palgrave. p. 18. ISBN 978-1-137-49661-4. ^ "Welcome to Ministry of Health, Labour and Welfare,". ^ a b Harden, Blaine (September 7, 2009). "Health Care in Japan: Low-Cost, for Now Aging Population Could Strain System". The Washington Post. Retrieved January 28, 2010. ^ Asai, Kadooka (July 14, 2017). "Open Access Misuse of Emergent Healthcare in Contemporary Japan". Retrieved December 8, 2017. ^ Yamaguchi, Mari (February 4, 2009). "Injured man dies after rejection by 14 hospitals". Associated Press. NBC News. ^ Kyodo News (Nov 6, 2008). "Another case emerges of pregnant woman rejected by Tokyo hospitals". The Japan Times. Retrieved January 28, 2010. ^ Reid, T.R. (April 14, 2008). "Japanese Pay Less for More Health Care". NPR. Retrieved January 28, 2010. ^ a b c "Health Insurance". City of Kagoshima. 2010. Archived from the original on December 27, 2009. Retrieved January 28, 2010. ^ a b Britnell, Mark (2015). In Search of the Perfect Health System. London: Palgrave. p. 16. ISBN 978-1-137-49661-4. ^ Yosomono (November 28, 2009). "How to navigate the Japanese Health System". gaijinass. Retrieved January 28, 2010. ^ Rapoport-Jacobs-Jonsson 1973, p. 157. ^ Fukue, Natsuko, "National health insurance a basic universal safety net", Japan Times, May 25, 2010, p.3. ^ Atsushi, Yoshida. "How Do Japanese Health Insurance Societies Finance Their Contributions To The Health Service Systems For The Elderly?". Japanese Economic Review. 64: 1. ^ Osamu, Saigusa. "Japan's Healthcare System and Pharmaceutical Industry". Journal of Generic Medicine. 4: 1. ^ "Healthcare Providers Industry Profile: Japan". Healthcare Providers Industry. April 2017 – via Ebscohost. ^ Caprio, Mark (2009). Democracy in Occupied Japan. p. 172. ^ Hasegawa, Hiroshi (September 11, 2017). "Japan: Healthcare J-Reits". International Financial Law Review: 21. ^ Kōdansha 1993, p. 338. ^ Ikegami, Naoki (17 September 2011). "Japanese universal health coverage: evolution, achievements, and challenges". The Lancet. 378 (9796): 1108. doi:10.1016/S0140-6736(11)60828-3. PMID 21885107.